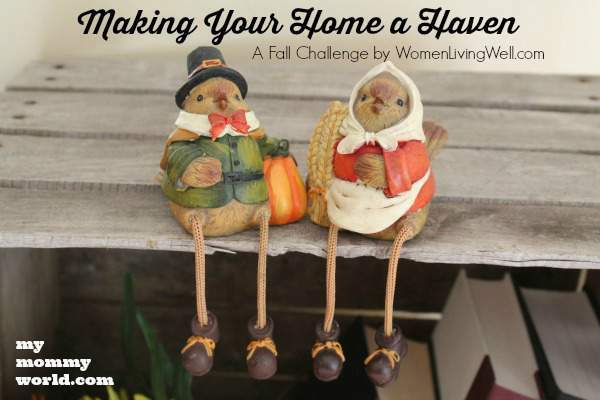 I hope you are enjoying the Making Your Home a Haven challenge! We are following along with Courtney of Women Living Well, and this week, she suggests listening to soothing music and working on gentleness and self-control. I have to admit, I’m normally a very quiet, nice person, but when I’ve run out of patience or am just frustrated at something that doesn’t go the way I think it should, I can blow a gasket! In fact, just a few weeks ago, after the painters had packed up all of their things and left, I had a little meltdown. My dad was here on his annual visit, the house had been torn up pretty much the entire time he was here, and everything was a mess. As soon as I closed the door on the last worker, I went to work myself, putting all the furniture back where it belonged, hanging up pictures again, vacuuming and mopping. The kids’ rooms were also a mess. Because they had to take everything out of my son’s closet to get access to the attic, and they had also painted in my daughter’s room, I had a big job in both of those rooms as well. Oh, and did I mention that the majority of that day’s laundry still had to be dried and folded? Normally, this kind of thing wouldn’t bother me so badly, but with my dad here, I wanted everything to be “perfect,” and clearly it was not. So I tried to hurry and right everything in the house before the kids got home from school. We had plans to have a nice steak dinner at home to celebrate my dad’s birthday that night and I just wanted to be able to sit at our dining room table and relax afterward on the couch. With most of the work done, I ran over to the grocery store to pick up some meat for dinner. Of course, they didn’t have any of the kind my dad had requested, so I bought another cut of steak, hoping that he would still enjoy it. When I arrived home, I noticed all the work that still had to be done, and it put me over the edge. …and a whole family sitting around playing with toys or online, not trying to help get things back in order. So I lost my patience and yelled at my husband and kids for not helping. I created a mood in my home that afternoon where all my loved ones had to walk on eggshells lest they set Mom off again. Luckily, I realized what I had done a few minutes later and apologized to them, asking for their forgiveness, but the damage was done, so to speak. Of course, I had caused most of the trouble myself…I had not asked anyone to help with any of the work, I had just assumed that they would notice what was undone and get to work. And I had an unrealistic expectations of a “perfect” birthday for my dad in the midst of all the home repairs. Music has a way of influencing emotions. When you’re feeling sad, listening to upbeat music can change your mood. Likewise, calming music helps you feel more peaceful and more graceful. In our home, we started listening to more instrumental music after I heard Sally Clarkson suggest it. I found several free and some very inexpensive albums on Amazon that help us promote a calm atmosphere during the often crazy dinner hour. One of my favorite things to listen to is Classical Music for the Reader 5: Great Masterpieces for the Dedicated Reader (affiliate link), which I downloaded for only $.99. I play this album constantly, as it is very soothing and is over 2 hours long. We are also big fans of Celtic music, and I like to play it often. I picked up this Green Hill Celtic Music Sampler (affiliate link) for free several weeks ago, and highly recommend it. I also sometimes play our favorite Celtic Woman (affiliate link) CD during dinner. The kids love to hear their albums from vacation Bible school (affiliate link)…I think we have 4 or 5 of them now! They are fun for getting the kids energized to clean up or just for having fun dancing around the kitchen. I also love listening to podcasts while I’m cleaning or cooking dinner. Some of my favorites are The Dave Ramsey Show, So Here’s the Thing with Kathi Lipp (for moms) and Amplify (for bloggers). How do you promote gentleness in yourself? Share with us some of your favorite music! Thank you for sharing that story, Erin. I’ve also found myself getting upset at having so much work to get done but realize (sometimes) that I haven’t asked anyone for help. Just asking for help makes a big difference, and you’ve reminded me that I need to do it more often. My husband reminds me often that the kids need to help more. He will often tell me, let the kids do that. I know I’m one to take on the work myself and not ask for help, but I’m working on getting the kids to do certain tasks. As far as music I don’t listen to much but I’m often subjected to my husband’s favorites. One of which is the Bee Gees.